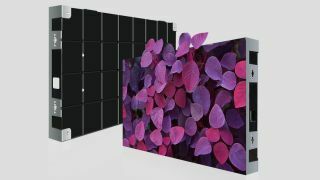 The What: Vanguard has introduced its newest fine pixel-pitch direct-view LED display, the Axion series. The What Else: Axion series cabinets feature a native 16:9 aspect ratio, and are designed to display full HD, 4K, and 8K video, with additional support for 3D. They feature refresh rates up to 3,840Hz, up to 24-bit color processing, and contrast ratio of 5,000:1 through use of black LEDs. All cabinets are front-serviceable, and their low-profile mask offers wide viewing angles. The Bottom Line: Each cabinet in the Axion line has the available option to add redundant power and data, and their cable-less design allows for easier maintenance and improved stability. Axion frames can be suspended from the ceiling, wall mounted, recessed, or ground supported for installation flexibility, and quick locks speed installation.